Satisfying clients demands including high-mix/small-lot production and short delivery time. Analogue screen printing was the only major business. 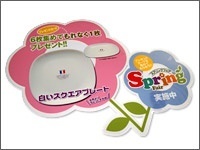 Digital inkjet printing brought new ideas and business opportunities. the persuasive sales become possible. Industry: Screen printing, product processing, 2D and 3D products. Installed printer: UV curing inkjet printer "UJF-605C", Solvent inkjet printer "JV3 series", Multi cutting plotter "CG-130FX"
In 1948, they started their business with the mimeograph and the textile printing, dealing with washcloth, wrapping cloth, fusuma (a vertical rectangular panel). 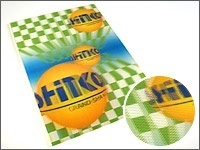 The greatest strength of the company is its wide variety of the special printing. The representatives of the processing technology is, spot clear, shrink printing, pseudo etching, scratch printing, phosphorescence printing, micro scent, temperature sensitive, tatoo printing, and so on. As for the substrate, almost all of the material is available such as, paper, glass, plastic, synthetic resin, metal, and cloth. Since they handle offset printing, printing on the several shape of the material is the added value. What is notable is not only the abundance of the printing variation but also the product planning of the original promoting product. For instance, the authentic looking molded poster "Sawaritai (the poster which looks like the real stuff is put on the surface)", the typing practice supporter for biginners of the computer "Key board seal", and "Braille business card" printing the transparent UV resin again and again. These promoting products are just small parts of all ― there are the more various products collectively developped with other companies. It is rare that the printing company have its own products, since printing company takes care of the subcontract work in many cases. Being in the printing industry where the price competition becomes intensified, they plan and develop the original products with their technology, and utilize the products for new business development. "As we had taken the high road of silk screen printing, the digital printing was totally at the opposite side. We had a confidence that the screen printing, which has unique thickness of ink and high light resistance, is better than any other printing method. However, in recent years, it is a fact that the analog printng cannot meet the demands of the client such as the limited production of diversified products, and the short turnaround. The running cost of the screen printing including plate cost and mold cost is high, and this runs up cost when it comes to deal with the small amount production. 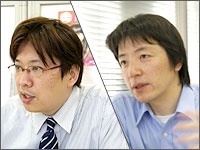 Then, we found it necessary to break the stereotype of the conventional printing" said Mr. Miyasaka. They thought that it was difficult to plan and develop new products considering cost effectiveness without taking advantage of the digital printing in conjunction with the analog printing. 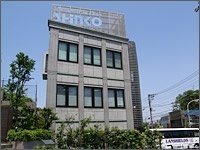 This situation led them to introduce Mimaki's printer with the opening of the new premises in April, 2005. "When adopting digital printing technology, we wanted to introduce the flat bed type inkjet printer which can print on the material of varied shape. Then, we decided to buy UJF-605C. Now, one of the floor of the new premises is the production division. On the production floor, UJV-605C, JV3 series, and CG-130FX, ― which they bought at the same time with the purchase of UJF-605C ― are in full production. To respond to the both of the digital printing and the analog printing, they made the analog printing section independent. "A year and half passed, after introduced UJF-605C as a main machine. We realized that the UJF-605C enabled us to receive a wider variety of offters. As we are in the age that the speed and the flexibility are required in our operation, the existence of UJF-605C is the big advantage." said Mr.Miyasaka. 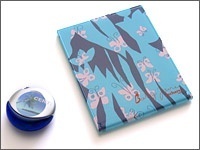 For example, when printing the image of the animation characters on the back side of the novelty such as hand mirror. At first we received orders of the screen printing. However, the smooth gradation was not expressed by using the silk plate, and also, the seal printing is unfit for applying to the novelty as it will be ripped off easily. In case of the in-mold forming, the cost is high since it is not suitable for the small amount production. After all, the digital printing is the best solution in the points having the high cost-effectiveness and the satisfying image quality. "It is really helpful that UJF-605 do not choose the material to print on. The gradation expression is excellent and the white ink is available. These elements widen the color expression regardless of the material. We mainly use acrylic plate with 2-3mm thick, and UJF-605C can handle solid objects up to 50mm thick. This is a great advantage, and there are no complaints about the image quality and the print speed." said Mr. Shibata. As the digital printing performs process expressions, the color is not better than that of screen printing. 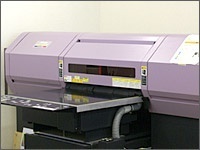 However, the digital printing is predominant with respect to the cost. When the accurate color reproduction is required such as the corporate color, they use screen printing partly. Having both of the digital printing and analog printing, they can choose the best printng method according to the required quality and cost. In doing so, they provide high value added and satisfying products to the customer.